Lawrence Mazzanovich loved to paint, but he had a hard time deciding when a piece was complete. Mazzy, as his friends called him, was so resistant to signing off on his works that his first wife “had to yank them off the easel to get them to market,” says Asheville-based art historian and author Michael J. McCue. The painter, born in 1871 on a ship off the coast of California, trained in Chicago and Paris before settling in the village of Tryon in 1923. 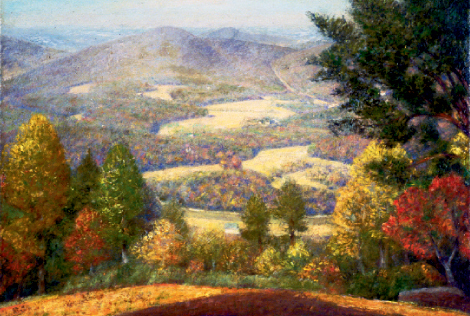 He specialized in vivid, impressionist landscapes of mountain settings, and was drawn, like many of his contemporaries, to the increasingly cosmopolitan atmosphere Tryon offered. Mazzanovich captured the area’s seasons on canvas until his death in 1959. He also was perhaps the best-known longtime member of what’s now referred to as the Tryon Artist Colony, which, given its vibrancy, was surprisingly obscure until recent years. While some came from as far away as Italy, most members of the loose-knit network of artists hailed from northern states, though some were locals. The forces that drew them were many: the area’s natural beauty and mild climate, the relatively low cost of living, and the chance to pursue their art away from the momentum of the big cities. The colony got its start in the 1890s. That’s when watercolor artist Amelia Watson and writer/photographer Margaret Morley wintered at actor and playwright William Gillette’s home. Tryon was an easily accessible getaway spot because of the early arrival of the railroad in 1877. As artists shared their stories of Tryon’s idyllic setting with friends back home, more and more sojourned to the mountain retreat. What happened during the next half century was showcased in a groundbreaking retrospective, “Tryon Artists, 1892 to 1942: The First Fifty Years,” hosted in 2001 by the town’s Upstairs Artspace gallery. Thanks to that exhibit, which McCue cocurated, and a book he wrote sharing the same title, the town’s rich and varied offerings are starting to secure much-belated recognition. What is evident in McCue’s book is that artists who came to visit or stay, in either case, nurtured their passion among a small but noteworthy community of similarly dedicated hands. The colony was unique in many respects in its day; for example, roughly half of its artists were female. Many of the artists found international acclaim for the work they did in Tryon. Along with the aforementioned Mazzanovich, Morley, and Watson, McCue notes that among them were painters Josephine S. Couper, Augustus Vincent Tack, and Elliott Daingerfield, illustrator George Aid, and art photographer Amelia Van Buren. And artist/writer Edward Waldo Emerson, son of Ralph Waldo Emerson, made Tryon his winter residence during this period. With increasing attention drawn to the work of those and other area artists, the colony is finally getting its historical due compared with 10 years ago when McCue started this work. “A number of leading scholars in the field of United States art history are now aware of Tryon,” says McCue. “And there’s been an explosion of interest in this whole colony phenomenon,” he adds, citing other successful (and, admittedly, better known) artist enclaves like Laguna Beach, California; Taos, New Mexico; and Woodstock, New York. And while most of the works of early Tryon artists are strewn across the country in galleries, museums, and private collections, signature pieces—including one of Mazzanovich’s large landscapes—are available for viewing at Tryon’s Lanier Library. The town’s art history is still being told as it has remained fertile cultural ground even after the days of the colony. In the decades that have followed, “this has remained a magical place that has a draw for creative people,” notes Upstairs Artspace manager Wyndy Morehead. She and other locals can recite the names of Tryon-based artists who continue to put the town on the map, including Cathy Smith Bowers, who was named North Carolina’s poet laureate in January; best-selling mystery writer Lilian Jackson Braun; renowned portraitist Rich Nelson; and acclaimed sculptors Will Behrends and Philip Dusenbury, among others.